There’s a good chance Texas will have only nine Democratic senators by the end of the midterms – the lowest amount in modern Texas history. A hearing for Senate Bill 4, the bill outlawing so-called sanctuary cities, in the Texas Senate in February 2017. Six months ago, Texas Democrats needed to win just two seats to cut into the power of Lt. Gov. Dan Patrick. Now, if Democrats are unable to win four seats on Nov. 6, they will have little to no power in preventing conservative Senate bills from being passed during the upcoming legislative session. Jeremy Wallace, reporter for the Houston Chronicle, says that these wounds have been self-inflicted. 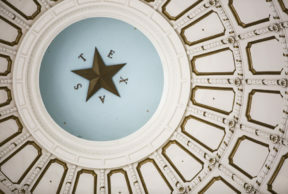 He says as of now, there’s a good chance Texas will have just nine Democratic senators when the new legislative session begins in January.